I ordered silver lavender spray and silver lavender gel for ringworm and hotspot treatment for my cats and I also got some of the mouth sprays. I was having gum issues and was at the dentist every 3 months for antibiotic PACs in my gum line. I was unable to go to the dentist for almost 2 years and flossed and used your mouth spray and when I made it back to dentist, my mouth had healed. My dentist was amazed and asked what I had done. I didn't do anything different except your cinnamon and Peppermint mouth sprays. And the silver lavender gel smells amazing and worked on the cats skin issues great. So thank you! If you've ordered recently, you've seen that we now teach our customers how to make the oral and lavender sprays. 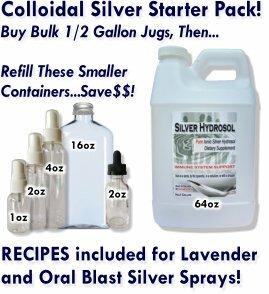 We sell you the bulk jug of colloidal silver hydrosol, provide empty spray bottles for a nominal charge, and you simply add drops of your favorite essential oils according to the simple recipe...easy breezy! My personal favorite is the peppermint spray. It's invigorating, the taste is amazing and it truly cleanses my mouth. We've gotten several testimonials about how our gels quickly relieved hotspots on cats. Others have used it as a facial treatment, including for acne. It's really a nice product as you said. Thanks again and please share more stories!